Mattie Clyburn Rice is the second black "Real Daughter" to be recognized by the United Daughters of the Confederacy. Mattie Clyburn Rice, 88, spent years searching through archives to prove her father was a black Confederate. As she leafs through a notebook filled with official-looking papers, Rice stops to read a faded photocopy with details of her father's military service. "At Hilton Head while under fire of the enemy, he carried his master out of the field of fire on his shoulder, that he performed personal service for Robert E. Lee. That was his pension record," Rice says. The Lt. F. C. Frazier has been blessed recently with the discovery of a REAL DAUGHTER of a Confederate Veteran living in our town. Mrs. Mattie Clyburn Rice's father, Wary Clyburn, served with honor in Co. E, 12th Regt. South Carolina Volunteers. 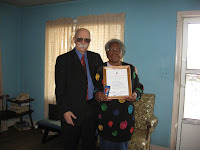 This picture shows Mrs. Rice receiving her Real Daughter's certificate from Commander Herman White. Mrs. Rice entertained Commander White with stories of researching her father's service during her off hours while working at Walter Reed Hospital in Washington, DC. 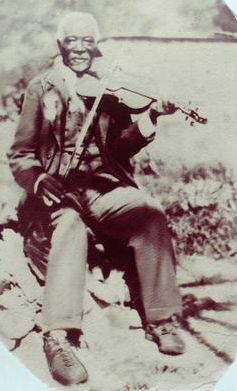 The Lt. F. C. Frazier Camp is proud to have a living child of a Confederate Hero in its midst.